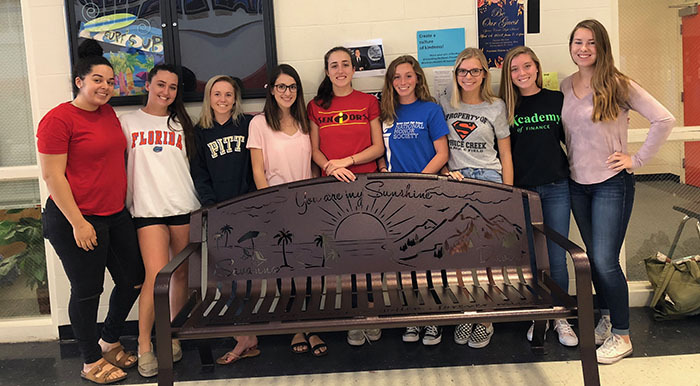 The bench memorial was created as a beautiful tribute to loved ones that have passed. 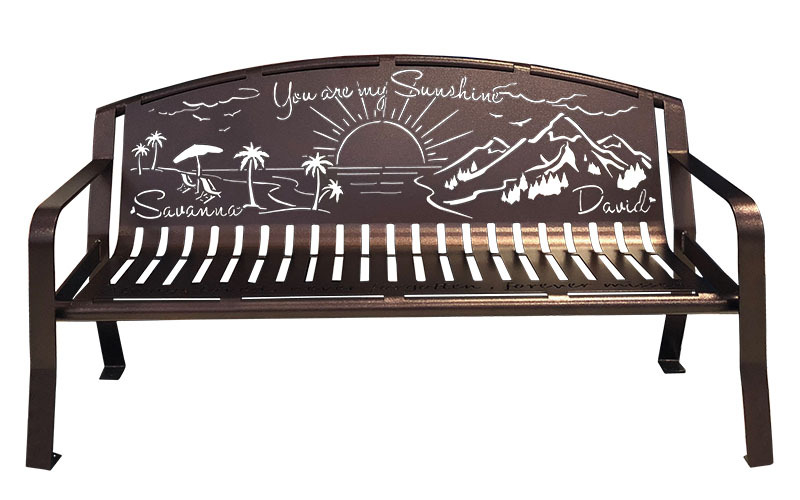 The bench is available with custom designs, inscriptions, and color options. We have found the bench memorial to be a form of healing and remembering. Thank you for allowing us to be apart of that journey. Call (801) 414-1724 or send an email to russelhsmith@gmail.com to get started on your bench order. To get started on the memorial bench by sending us your ideas. 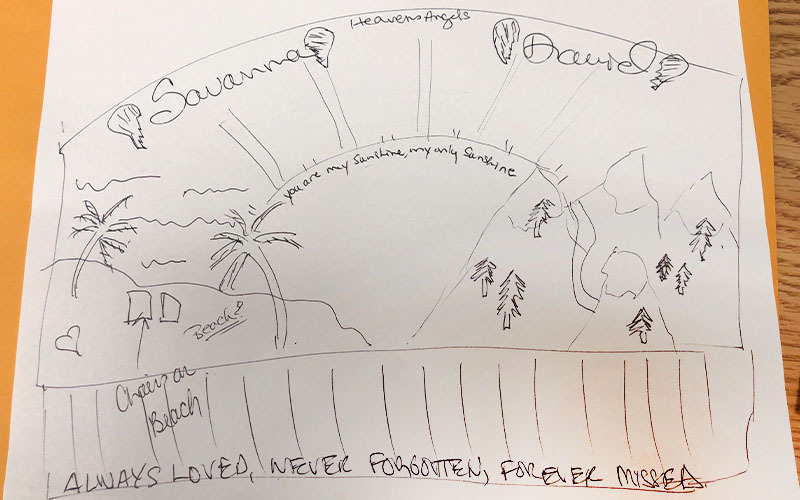 This can be a sketch that shows how you want the memorial bench to look. You can also send Word Docs, AI Files, and more. Our designers take your ideas and turn it into a bench proof. This is a realistic look at how the finished bench will look. It will be sent to you for final approval before cutting. The bench is cut from a sheet of metal that is then bent into shape. A powder coat is applied for a durable finish. The bench memorial is then shipped to you. The bench memorial brings friends, family, and community together. It can be placed in a local park, cemetery, school, and more. Somewhere that will act as a spot for contemplating, remembering, and being together. Inside or outside. Rain or shine. The memorial benches are designed to hold up without succumbing to rust and corrosion. 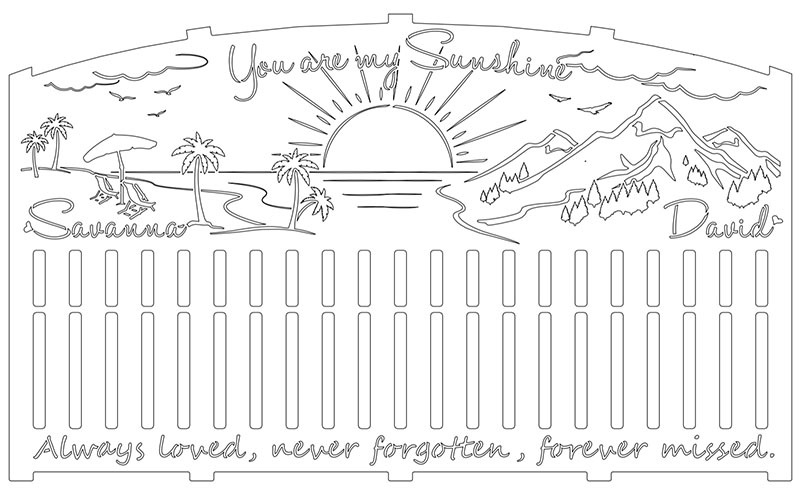 We work with you on custom designs for the memorial bench. This can include: portraits, inscriptions, sceneries, and more. Each bench is sandblasted, primed, and powder coated to a smooth finish. The powder coat is available in a variety of color options. The bench memorials are available in three styles: Classic, Classic Arch, and Metropolitan. Classic Arch is most used. Going through loss is hard and everyone grieves in a different way. Having a memorial bench provides a space for everyone. Although some families choose to put the bench in the cemetery, many select other locations. The Savanna and David Bench was placed at their school. This was a place that was important to them and where they met many of their friends. Now the bench acts as a place to reminisce and remember.